King of Aragon (1276-85). Although Pedro III. protected the Jews from the hatred of the clergy, who destroyed their vineyards and disturbed their graves, and though he took especially severe measures against the Bishop of Castellnou, who favored these outrages (see Jew. Encyc. v. 636a, s.v. Gerona), yet he did this more in his own interest than from any humanitarian motive. He was one of the kings of Aragon who placed the Jews under contribution and exacted enormous taxes from them. They supported him in his wars against Africa, Sicily, and France with voluntary subsidies. When, in 1283, he was threatened with invasion by France, he made the Jews of Faca and Gerona and their districts bear half the expense of improving the towers and fortifications; and a year later the Jews of his state had to raise 130,000 sueldos in taxes at the shortest notice. When he wished to marry his daughter to King Diniz of Portugal, he found that the sum of 185,000 sueldos of the promised dowry was lacking; thereupon he imposed a tax for that amount on the Jews. As soon as he did not require money from the Jews he ceased to be gracious to them. In 1278 he threatened them with the loss of all their privileges if these were not submitted to him for confirmation within a month. 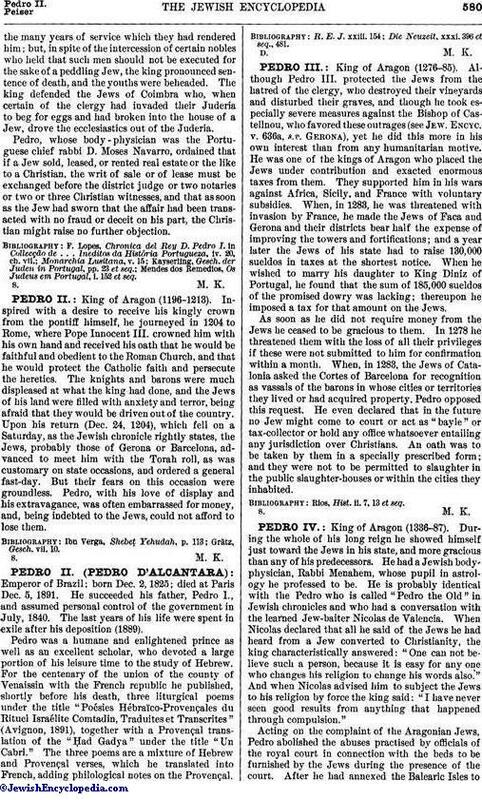 When, in 1283, the Jews of Catalonia asked the Cortes of Barcelona for recognition as vassals of the barons in whose cities or territories they lived or had acquired property, Pedro opposed this request. He even declared that in the future no Jew might come to court or act as "bayle" or tax-collector or hold any office whatsoever entailing any jurisdiction over Christians. An oath was to be taken by them in a specially prescribed form; and they were not to be permitted to slaughter in the public slaughter-houses or within the cities they inhabited. Rios, Hist. ii. 7, 13 et seq.